Imagine being able to test drive a car before you buy it, by getting that car from a giant vending machine. Ford is doing just that and they hope that the novelty of this new idea will entice more people to buy their vehicles. 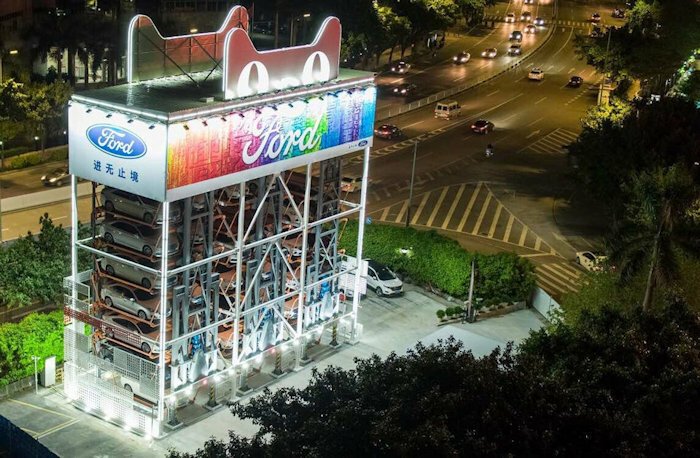 Ford has set up its first giant vending machine with Chinese e-commerce giant Alibaba. The two companies entered into this about two years ago and now it is ready to go. This giant multi-story building is located in Guangzhou, China and called the Super Test-Drive Center. It holds dozens of Ford cars. Just select the car you want from Alibaba’s Tmall app and then take it for a three-day test drive. This will give you plenty of time to get used to the new car and decide whether or not you want to purchase it. They have several models to choose from. The program uses Alibaba’s services and gives potential customers discounts and incentives depending upon their usage on Alibaba’s ecosystem. Ford really hopes this will help them sell more cars and if it does, maybe we will see more of these giant vending machines pop up elsewhere. We will have to see how this goes.